Staff Meeting is a new series spotlighting Jama Software team members. Everybody knows customers value good service. The one variable is that each company has a different idea of what constitutes great customer service. 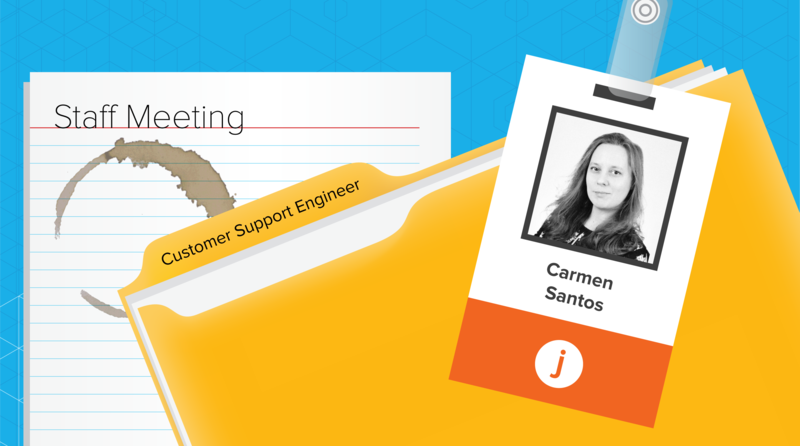 At Jama Software, we believe one key aspect of excellent service is providing highly-personalized support. We facilitate that goal a number of ways, whether it’s through the daily, digital interactions on our Jama Community or via the assistance of team members across the world who passionately help customers solve issues. Fluent in multiple languages, Carmen Santos and Gustavo Flores are two of our customer support engineers in Portugal who support our teams in Portland and Amsterdam. Both operate in Central European Summer Time (CEST), so they’re able to better assist customers going about their work days in places like the United Kingdom, France, Germany, the Netherlands, and beyond. To shed some insight on how Carmen and Gustavo go about serving Jama customers around the globe, we asked them about it. How long have you lived in Portugal and what part of the country do you live in? Carmen Santos: I was born and raised in Sintra, a beautiful town up north of Lisbon. Sintra has many exquisite palaces and is surrounded by nature. It’s located between mountains and the sea, which may explain why I started to enjoy camping, hiking and exploring nature at a very young age. I still do that today with my family. Gustavo Flores: I was born in Brazil but I was raised in Portugal, more specifically in Lisbon, the capital, which is located by the ocean almost midway between the north and the south. I have been here for the last 30 years. What’s a day in your life like working for Jama? CS: I start early at 7 a.m. CEST, and my main task is to assist customers with questions about functionality or those who are facing difficulties. Amongst other tasks, I also write content for the Community site. By the end of my shift, I always meet with my colleagues starting their shift in Portland and hand-over escalations, incidents or discuss new findings on particular use cases. GF: Since it has been almost three years now, working remotely feels almost like another day in a normal office, working 9 a.m. to 6 p.m. Working with folks in Portland and Amsterdam is awesome, and everyone is really available and willing to help. In an average week, how many customers from different parts of the world to you speak with? CS: We have customers with project teams spread geographically, so I may be speaking with users in Australia or India in the morning, moving to all Europe (from Eastern, Nordic countries to Ireland), and ending the shift working with folks on the East Cost in the US. GF: On a good day, we can talk to people from a dozen different countries. I would say the bulk of the customers I talk to are mostly central European (mainly Germany and Netherlands), UK and the US East Coast. What’s been one of the more interesting customer issues you’ve helped someone solve recently? CS: A case where the customer’s ALM configuration was preventing the Legacy Connector to sync with Jama. From a Jama support perspective, we go all the way to ensure our tool isn’t misbehaving. And it’s always so good when we help the customer beyond their expectations. GF: The most interesting one that comes to memory would be where I worked with the customer on a REST API app. The app would remove any Base64 images and re-add them as attachments in order to decrease the database size, increasing Jama performance in the process. What’s your favorite part about working with customers? CS: I love interacting with people, and feel like customer care is a sort of mission. I feel grateful when I can remove a blockage for someone else’s satisfaction with work. I also like to simplify complex concepts into a language that’s accessible for everyone. GF: I love the cultural interactions with customers of different nationalities. CS: I believe it was harder in the beginning, especially because this is my first experience working remotely, but the fact that I feel confident in my team covering when I am off helps a lot. Also, I have children, so I guess they’ve signed up for that job! GF: I mostly spend time with my kids and also enjoy some gaming time. Learn more about Jama and our customers here.